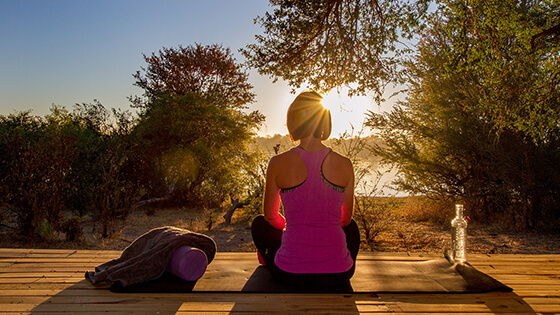 WHETHER it is a sunrise yoga session overlooking the mighty Zambezi River or meditation on the deck gazing out over the African bush at sundown, Zambezi Crescent Collection’s luxury Victoria Falls River Lodge offers a unique yoga safari retreat experience. Mindfulness and Wellness Travel have in recent years been identified as a popular global travelling trend. The movement involves travellers taking time out to consciously appreciate the natural surroundings of their destination, while feeding their body, mind and soul with wellness activities, like yoga and meditation. In fact, the yoga safari movement – dubbed “wellness in the wilderness” – was identified as the most significant new trend to emerge in African travel by the World Travel Market Global Trends Report 2016. The report states that safari holidays, one of the continent’s most important segments, are increasingly including yoga, spa and meditation as part of the itinerary. Yoga Safari Guide and American full-time yoga teacher Dianne Falk explains that the purpose of combining yoga with an African Safari is to “take the voyage out to find the space within”. For the past five years Falk, and fellow Yoga Safari Guide Beth Wallace, have travelled on yoga safaris to Botswana, Zimbabwe, Zambia and South Africa, with groups of varying sizes. “During both trips we found our hosts to be wonderfully accommodating and interested in our group. This year we found an elevated experience where the management team extended the offer to practice yoga and meditation in the Spa which overlooks the river. It was beautiful, peaceful and our hosts even prepared the space for us and left essential oils diffusing. The space was quiet, serene and completely perfect. Our travellers were amazed,” said Falk. The types of destinations sought by the mindful traveller, are authentic, unique and adventurous settings. Falk said such distinctive locations often have quiet decks or elevated viewing piers overlooking spectacular natural beauty. In addition to plenty of yoga, relaxation and meditation, yoga safari travellers also enjoy a host of other safari activities at their destinations and are particularly interested in activities involving culture and conservation. They combine their yoga sessions and activities with light, healthy meals and Victoria Falls River Lodge is happy to provide delicious Vegan and Vegetarian meal options which are often required by yoga safari travellers. “Location and staff are paramount in assuring the success of any mindfulness retreat. The ability to find peace, quiet and beautiful surroundings are essential, but the real gem is finding a property where your hosts understand, anticipate and cater to your needs… Zambezi Crescent’s name is synonymous with luxury and care. This year we truly felt that every member of the management team knew the group,” Falk said.